The curriculum of the Master's degree program comprises three LEM "theory-semester" as well as the fourth intended for the preparation of the master-thesis. This means a standard study period of four semesters over a period of two years. 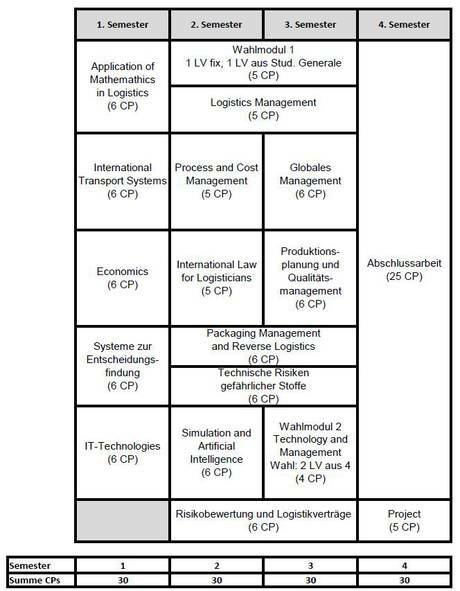 Planned as a consecutive course to our Bachelor's program Transport Engineering / Logistics course - but also open to suitably qualified other students - the LEM course is based on a deliberately broad orientation (logistics as a cross-cutting function) detailed knowledge about logistical issues as well as on issues of management in an international context. According to that the first three semesters convey, in addition to advanced skills in the field of technical logistics - management skills, skills to conceptual work, taking into account efficiency and sustainability. They address important specific subject aspects of the various interdisciplinary topics of logistics and are developed in accordance with students competencies. In the first semester the advanced skills in the fields of mathematics, economics, information technology, and decision-making a provided. There is in the subsequent modules of the second and third semester an increasing focus on issues of management. For individual promotion of students’ interests , two elective modules are included in the curriculum. They allow a selection of elective courses from an extended range of courses. Some of the courses to be found in the Master's degree program can be visited also by students of the Master's degree program of Integrated Safety and Security Management (ISSM).